Mexico's Marxist led "Alliance for the Good of All", is not taking its recent razor thin electoral defeat lying down. Alliance leader Andres Manuel Lopez Obrador has accused the victorious National Action Party of massive fraud and is claiming to be the rightful president of Mexico. He is calling on the left to take to the streets in a massive campaign of civil disobedience. Mexicans went to the polls on July 2 to elect a new president. Officially, Felipe Calderon from the pro-business National Action Party won by 0.58%. However, it has become increasingly clear that the elections were stolen by Calderon with the help of the Federal Electoral Institute. Opponents of Calderon have responded with mass demonstrations in the country’s capital. Andres Manuel Lopez Obrador, the opposition candidate from the Alliance For the Good of All coalition, which includes the Party of the Democratic Revolution, has claimed he won the vote. Obrador, who ran under the slogan “For the good of all, the poor first”, has called for a national campaign of civil disobedience. On July 9, within a week of the election, close to 1 million people protested at the central square in Mexico City condemning the fraud. Obrador held another demonstration at the Zocalo (Mexico City’s central plaza) on July 16, which was attended by hundreds of thousands protesting the vote-rigging. 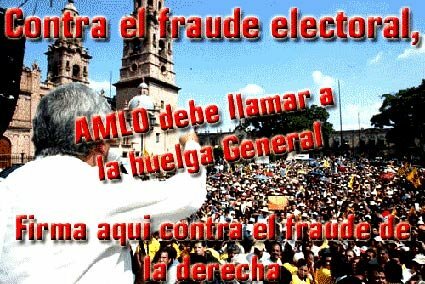 Obrador has announced that a civil coalition will plan a campaign against the electoral fraud and he has called for another mass mobilisation on July 30.